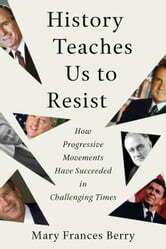 Historian and civil rights activist proves how progressive movements can flourish even in conservative times. Despair and mourning after the election of an antagonistic or polarizing president, such as Donald Trump, is part of the push-pull of American politics. But in this incisive book, historian Mary Frances Berry shows that resistance to presidential administrations has led to positive change and the defeat of outrageous proposals, even in challenging times. Noting that all presidents, including ones considered progressive, sometimes require massive organization to affect policy decisions, Berry cites Indigenous peoples' protests against the Dakota pipeline during Barack Obama's administration as a modern example of successful resistance built on earlier actions. Beginning with Franklin D. Roosevelt, Berry discusses that president's refusal to prevent race discrimination in the defense industry during World War II and the subsequent March on Washington movement. She analyzes Lyndon Johnson, the war in Vietnam, and the antiwar movement and then examines Ronald Reagan's two terms, which offer stories of opposition to reactionary policies, such as ignoring the AIDS crisis and retreating on racial progress, to show how resistance can succeed. The prochoice protests during the George H. W. Bush administration and the opposition to Bill Clinton's "Don't Ask, Don't Tell" policy, as well as his budget cuts and welfare reform, are also discussed, as are protests against the war in Iraq and the Patriot Act during George W. Bush's presidency. Throughout these varied examples, Berry underscores that even when resistance doesn't achieve all the goals of a particular movement, it often plants a seed that comes to fruition later. Berry also shares experiences from her six decades as an activist in various movements, including protesting the Vietnam War and advocating for the Free South Africa and civil rights movements, which provides an additional layer of insight from someone who was there. And as a result of having served in five presidential administrations, Berry brings an insider's knowledge of government. History Teaches Us to Resist is an essential book for our times which attests to the power of resistance. It proves to us through myriad historical examples that protest is an essential ingredient of politics, and that progressive movements can and will flourish, even in perilous times.